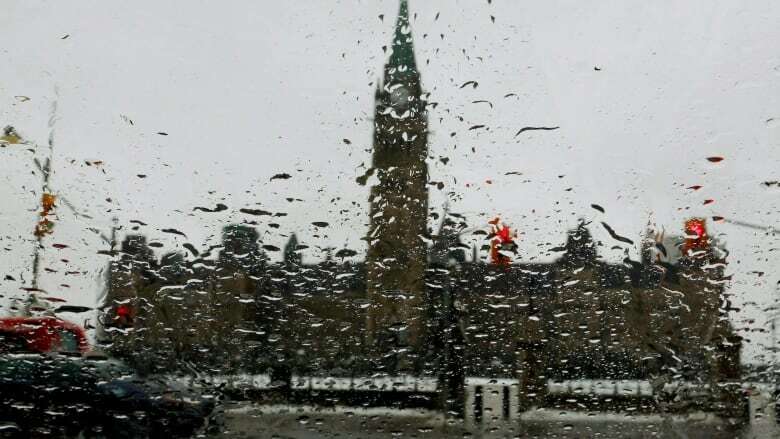 Environment Canada says Wednesday's rainfall in Ottawa broke the previous record set in 1969. Ottawa airport reported 60 mm of rainfall from midnight to 2:30 p.m., according to Environment Canada's Gerald Cheng. The Central Experimental Farm, meanwhile, reported more than 85 mm in the same time frame. The previous record observed at the airport was 41.1 mm in 1969. 61.4 millimetres ended up falling at the airport by the end of the day. A rainfall warning had been in place for Ottawa-Gatineau, Upper Gatineau, Renfrew and Lanark counties, Wednesday, but ended early in the afternoon. Since Monday, when the rainfall began, the total amount being reported at the airport is 91.5 mm. It's the second time this week that a rainfall record has been broken in Ottawa. On Monday 43 mm of rain was observed at the airport, breaking the previous record of 35.2 mm set in 1994. Flooding has caused lane reductions and road closures in some areas. The high is expected to reach 24 C, but the humidity will make it feel more like 32. There is a 40 per cent chance of showers or thundershowers tonight, and the temperature will drop to 19 C.
The rain should stop early Thursday morning with a high of 29 C and more humidity in store. But there's a chance of more rain on Thursday evening, Friday and Saturday.